What to do this summer? How about art? MOCHA artists bring painting, and sculpting and more to Oakland children at Oakland libraries. It is Summer and Your Library is Open! Books, bikes, and bubbles were at your library this weekend. This Saturday kids turned out all over Oakland to help kick-off the Summer Reading Program. Bubble-parties at many branches let families enjoy the sunshine with each other and their books, and a bike meet-up at the Main Library pedaled over to the West Oakland branch to enjoy an incredible Scraper Bike workshop with Tyrone "Baybe Champ" Stevenson. What's next? Check out the listings for your favorite performers and activites, or look to see what's happening this week at your branch. Fantasy series recommendations for kids who love Harry Potter -- in celebration of the series' 15th anniversary. How old does your child need to be to be enrolled in Summer Reading, you ask? You can enroll him as soon as he is born! 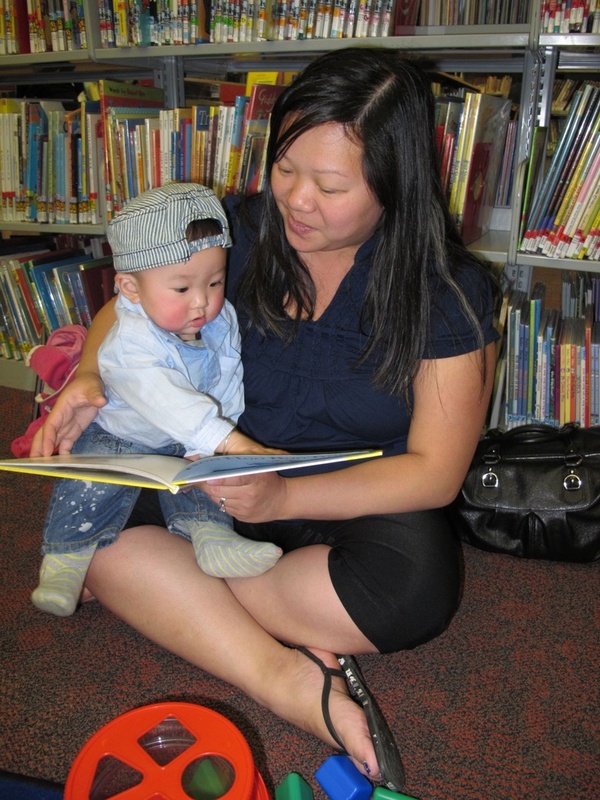 It is never too early to start reading with your baby; she will associate the security and pleasure of your lap with reading and will want to learn to read when she is older. Read with your baby every day. Try board books. Board books are books with hard pages your baby can throw, bite, and hit. You don’t need to read the words at all. Just point to the pictures and talk about them. Have him flip the pages. Let him play with the book. Comment as you read. Connect what you read to what's happening in her life. Keep their board books in the same place as toys. Let your child see you reading for yourself and enjoying it. Come to the library often! Find new books and come to storytime. Help your library help Oakland youth: Summer Lunch Volunteer Site Coordinators Needed! The Oakland Public Library needs your help to coordinate free summer lunch for children and teens! Did you know that most Oakland Public Libraries now serve free lunch for children and teens during the summer? We couldn't do it without the partnership of the Alameda County Community Food Bank, which recruits, trains, and places volunteers for the lunch service. In addition, they train volunteer Site Coordinators, who commit to at least two weeks of coordinating the other volunteers at a single library site, during lunch time. LGBTQ-themed children’s books at the Oakland Public Library. June is Pride month for the lesbian / gay / bisexual / transgender / queer community – a perfect time to explore these books with LGBTQ themes available at the Oakland Public Library. If you want more recommendations, check out the Rainbow Book lists for children and teens…and let us know here in the comments if you have any favorites to share! Happy reading, and happy Pride! Have you ever loved a book so much you wanted to eat it? Reading is So Delicious! Free family outdoor summer cinema at Studio One Arts Center in Oakland. Do you like to read the book before, or after you see the movie? Studio One Arts Center is hosting free family movies this summer; coming up this Friday: Matilda! Based on the book by Roald Dahl. Check them both out. Studio One Arts Center is hosting free family movies this summer; coming up this Friday: Matilda! Oakland Library loves children! Look at these pictures from our Día de los niños / Día de los libros celebrations. Día de los niños / Día de los libros (Children's Day/Book Day) is a celebration of children, families, and reading that culminates yearly on April 30th. This year Germar the Magician came to many of our libraries to help us celebrate. He entertained children of all ages with birds that appeared and disappeared, magic coins that did strange and marvelous things, and more. He did so seamlessly alternating between English and Spanish. A round-up of books for babies, featuring…babies!